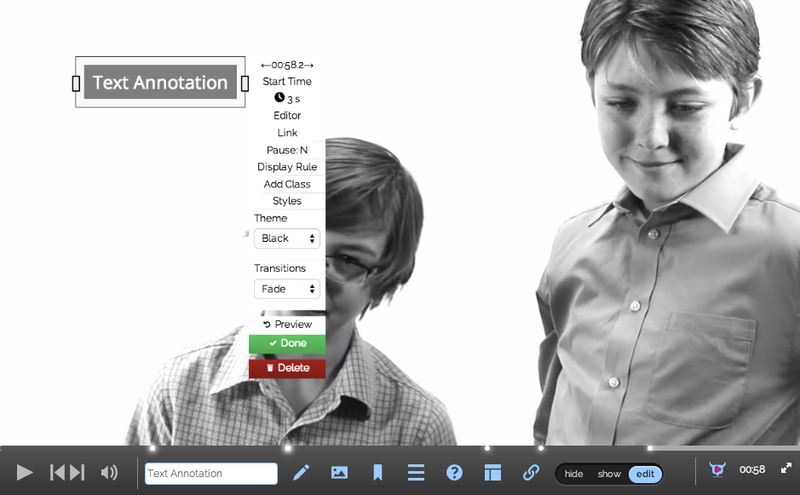 When you are editing a specific annotation, there is a set of options you use to configure it. You can set the start time ahead one second by clicking on the right arrow; back, by clicking on the left. Click 'Start Time' to fine tune it down to the thousands of a second or a specific percentage in the video. The start time field is flexible and accepts the following inputs. Pro Tip: % based and negative start times are particularly useful for templates. The duration of time that the annotation remains on screen. If Pause is set to Y, the duration of the annotation is the duration it is paused. What happens when a viewer clicks on the annotation. Detail here. Set Pause:Y if you'd like the video to pause when it reaches this annotation. Set Pause: N if not. Note when you set Pause:Y, the duration of the annotation is the duration it is paused. Note: When Pause is set to Y, ensure Gate is set to N.
A gate is a point in the video that a viewer can not pass unless they interact with that annotation. This is used most often to ensure that someone takes a quiz or submits an email before continuing on in the video. Note: When Gate is set to Y, ensure Pause is set to N.
Adds a specific CSS class to the project. Used to custom style specific annotations. Note, you will need to include this CSS class in a custom at your group-level CSS or project-level CSS. Change the background color and opacity. This will override any group-level or project-level style you have set. How the annotation appears and disappears from the screen.